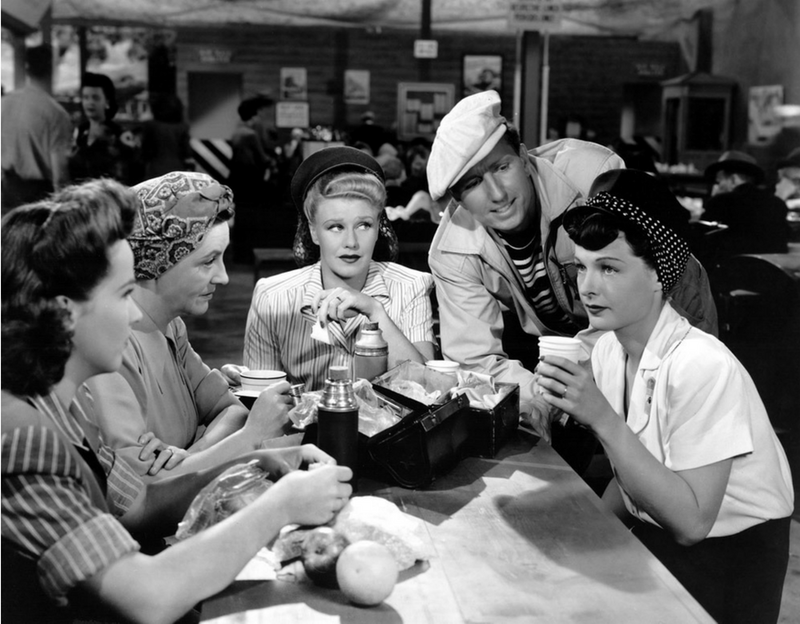 Tender Comrade (1943) is a sentimental WWII drama much in the style of Since You Went Away (1944). 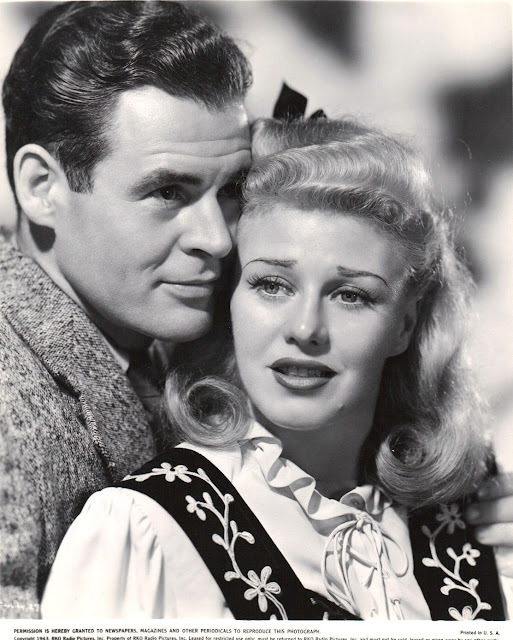 It follows the story of Jo Jones (Ginger Rogers) a fiesty and strong-willed woman married to mild-mannered soldier Chris (Robert Ryan). After Chris’ 24 hour leave, the two say their goodbyes at a train station as he travels overseas for battle. Doing her part for the war effort, Jo works at a local aircraft factory as a welder. She becomes friendly with a trio of women who've also been left behind. There’s Barbara (Ruth Hussey), an embittered woman who harbors bad feelings for her sailor husband. She openly dates other men and is the voice of discontent among the group. Then there is Doris (Kim Hunter), a sweet and starry-eyed newlywed. A proposal and quickie marriage left her in a suspended virginal state. Then there's Helen (Patricia Collinge), the matriarch and most level-headed of the bunch. Both her husband and son are away at war. All the women struggle to make ends meet and Jo comes up with an idea: they’ll all move in together and share the expenses equally. They add a fifth, Manya (Mady Christians), a German refugee whose husband is fighting the good fight against the Nazis. She takes on a job as a housekeeper. We follow their stories as they adjust to this new arrangement. The film is broken up with flashbacks of scenes from Jo and Chris’ courtship and marriage. It’s equal parts touching and tragic, just as you’d expect a WWII movie to be. Ginger Rogers was on a high point in her career. She had won an Academy Award for her performance in Kitty Foyle (which was also written by Dalton Trumbo). That film did well for RKO and Tender Comrade was a psuedo follow-up to that success. For Tender Comrade, Rogers was billed as the “chin-up girl”, a role model for women embodying the ideal of strength and resilience during wartime. The film premiered in Los Angeles on December 29, 1943, just under the wire to have Rogers’ performance qualify for Academy Award submission. In the end, she didn’t receive a nomination and the film was released to the general public in June 1944. I’ve always been partial to Ginger Rogers and her performances but I felt her role as Jo was overbearing. Perhaps it was the long speeches and the constant bickering, but I found her character not as sympathetic as I wanted her to be. On the other hand, Chris Jones was an exceptionally good part for Robert Ryan, who was still in the early days of his long acting career. Playing a leading romantic part with a major movie star helped put him on the map. Ryan is incredibly charming in this film. It’s a shame Hollywood relegated him to roles as heavies and villains because there was a “tender” side to him that really shone through. A few years after its release, Tender Comrade developed a reputation for its perceived Communist agenda. During the HUAC investigations, the film singled out for subversive propaganda and for the term “Comrade” and its connection to Communist Russia. Although the phrase "tender comrade" is a reference to Robert Louis Stevenson’s poem The Wife and is quoted at the very start of the film, its reasonable to consider an intended dual meaning. Trumbo is one of my favorite writers and a huge influence in my life. Reading his novel Johnny Got His Gun completely altered my perspective on the world and I tend to gravitate towards his works. I enjoyed the social commentary and the political subtext of the film even though I thought it to be overly sentimental. Trumbo was singled out by Lela Rogers, Ginger Rogers mother, during a HUAC hearing. During the filming of Tender Comrade, Rogers started to take issue with some of the dialogue and this was a very dialogue-driven film. In one scene, the German housekeeper receives her husband medal of honor in the mail. Its decided that the medal belongs to all of them and not just Manya. Rogers was supposed to deliver the line “share and share alike, that’s democracy” but instead it was given to Kim Hunter. The film has a bit of a socialist agenda: the give women split their profits evenly, Manya becomes upset at perceived excess and Doris confesses hoarding lipsticks. However I felt the movie as had some strong patriotic messaging. There is Ginger Rogers’ grand speech about the sacrifice needed to live in a better world. And there are various references to being patriotic through rationing and also anti-German and Japanese sentiment. But in the end Dmytryk and Trumbo were both blacklisted by the HUAC and Hollywood. Dmytryk went into exile only to return to the US and give testimony which eventually cleared him from the blacklist. Trumbo was more defiant. After being jailed, he continued to work in Hollywood under pseudonyms. It wasn’t until both Otto Preminger (Exodus) and Kirk Douglas (Spartacus) publicly listed Trumbo as screenwriter in their respective films that the blacklist officially ended. Tender Comrade holds an important place in the history of WWII films and the Hollywood Blacklist. This film makes its DVD debut thanks to the good folks at the Warner Archive Collection. 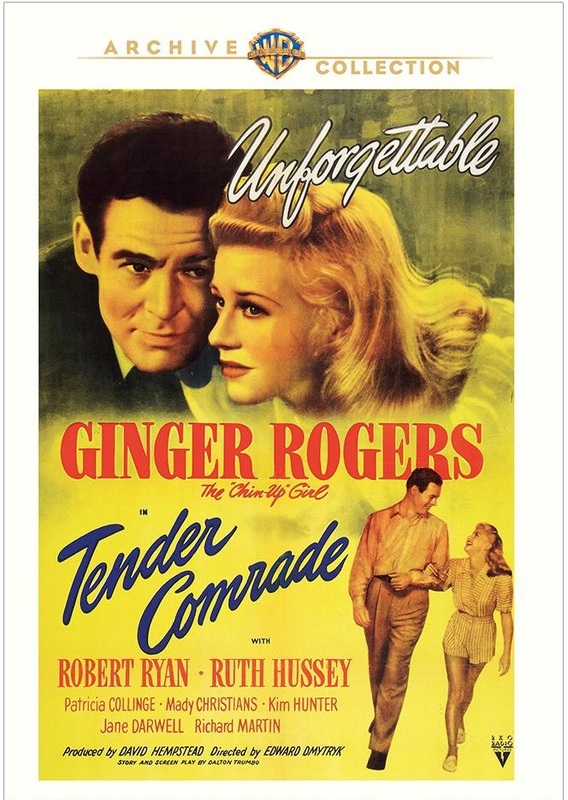 Tender Comrade (1943) is available on DVD-MOD from the Warner Archive Collection.When you use my buy links you help support this site. Thanks! The Warner Archive trio George, D.W. and Matt discuss the film (about 25 minutes in) on the A Colossal Collection episode of their podcast. Warner Archive Wednesday - On (random) Wednesdays, I review one title from the Warner Archive Collection. Thank you to Warner Archive for sending me Tender Comrade (1943) to review!